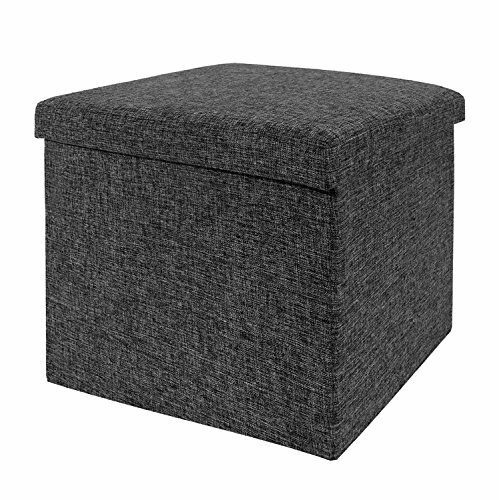 Furnish your home with Seville Classics' Foldable Storage Ottoman in Charcoal Gray. Remove the cushion top to reveal a generous storage area for organizing clothes, blankets, linens, toys, remotes and more! Doubles as a plush footrest in the living room and is ideal for use as a stool in communal work spaces, dorm halls, or commercial environments like lounges. Folding design means the cube sets up in seconds and uses little space in storage. Unit is lightweight (less than 8 lbs.) and folds away easily when out of use. Strong & Durable Construction - Seat supports up to 400 lbs. on the lid; strong enough for most people to sit.